Combine a visit to the glorious French capital with three days in the rolling countryside of Normandy and Brittany. 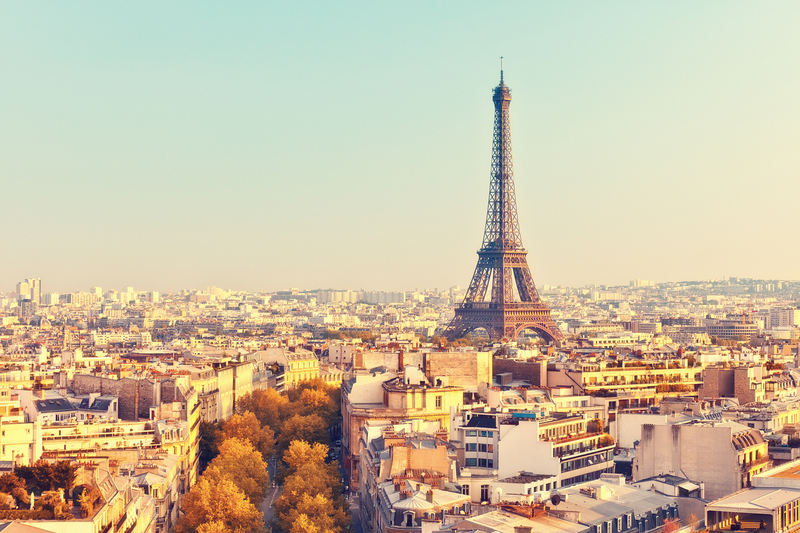 Enjoy an included tour of Paris taking in its most famous monuments and buildings . You’ll also have the chance to sample la vie Parisienne, before journeying, via Claude Monet’s famous garden, into the verdant Pays d’Auge – where fine cheese, cidre and calvados, and some delightful medieval towns and villages add to the holiday pleasure. Flights also available from airports in England – Belfast, Birmingham, Bristol, Liverpool, Gatwick, Luton, Southend, Manchester, Newcastle & Southampton – click here for more information on dates & prices. An exciting day awaits you, as after breakfast you board the coach to enjoy a guided tour of perhaps the world’s favourite city destination. Sit back as your tour manager brings to life the city’s iconic landmarks; including the Eiffel Tower, the Arc de Triomphe, gleaming Sacre Coeur and the Louvre.. Enjoy the bustle of the Parisian streets, the grands boulevards and the great parks, including the riverside Jardins des Tuileries. Following the tour, enjoy your own exploration, be it of the city’s historic heart, close to Notre-Dame cathedral, in village-like St-Paul, the aristocratic Marais or artists’ haven Montmartre. Perhaps you’ll take a trip up the Eiffel Tower or a cruise on the Seine, stroll the Champs-Elysees or simply tarry a while in a pavement cafe. Let the city, its transport system, or simply your walking shoes, arrange your time for you, before you return to the hotel at the end of a marvellous day. Bidding “au revoir” to the French capital, board the coach to journey into the beautiful Normandy countryside, to visit Giverny, home for over 40 years to Impressionist painter Claude Monet. Inspiration for many of his great works, the artist’s house has been lovingly restored, and now contains reproductions of his work. In the gardens, replanted to Monet’s design, you will find his studio and the lily pond, subject of many of his paintings. Continue on to your second holiday base, in the cathedral city of Lisieux, the capital of the cheese- and cider-producing Pays d’Auge region. Set in lush, rolling, orchard-dotted hills, Lisieux lies in the shadow of the vast Basilica of Saint Therese, and is centred around its more restrained cathedral. A perfect base from which to explore, Lisieux boasts a host of traditional cafes and restaurants serving Pays d’Auge specialities. Dine in the town or in the hotel’s poolside restaurant at your leisure. An included tour today sees you journey across the countryside, to one of France’s most beautiful and iconic sites – UNESCO-listed Mont Saint-Michel. Connected to the mainland by a narrow causeway, the small, inhabited island is dominated by its magnificent Benedictine abbey, which draws visitors from across the globe. Reach the top of the winding hill, lined with half-timbered houses, to discover spectacular views across the bay. Continue on into neighbouring Brittany, to spend the afternoon exploring the region’s elegant capital Rennes. Almost wholly destroyed by fire in 1720, the city was rebuilt to rival Paris in terms of grandeur. Explore its splendid neo-classical buildings and great squares, set against Medieval streets of the Les Lices area that survived the flames. After a wonderful day, you’ll return to Lisieux for the evening. With an “adieu’ to your Lisieux hosts, begin the return journey, adding two more Norman gems to your treasure chest of memories. First, you’ll make a short visit to delightful fishing port Honfleur, with its ancient harbour surrounded by step-gabled houses and colourful cafes. You’ll then follow the course of the meandering river upstream to Rouen. Here you’ll get the chance to explore the lovingly restored medieval gem, with its poignant place du Vieux-Marche, the site of Saint Joan’s martyrdom, its famous one-handed mechanical clock and its Gothic cathedral. Perhaps enjoy a last light-lunch before transferring to the airport and your early evening return flight to the UK, at the end of a wonderful French interlude.